In North Vancouver we saw more sales of all home types (detached, attached, apartments) this October compared with October 2016. We also had more listings of all property types, so in general the market was more active than this time last year. Over the year, the Benchmark Price for a “typical” North Van detached house rose a modest 2.1%, while townhouses were up 15% and apartments 21.5%. This reflects a trend across the region, where more affordable properties continue to rise rapidly, while more expensive ones are experiencing slower price appreciation. These days the housing market is a puzzle with a lot of pieces – so when the time comes to consider a move, an experienced REALTOR® is an important part of putting it all together. If you are contemplating a move next year, call us now to start your research and planning to get the best outcome. Last month’s MLS® sales (October ’17) in Greater Vancouver were 15% above the 10-year average for that month. But the supply-and-demand stats really tell the story: fully 35.3% more homes sold (demand) in October of this year than the same month a year before. But the total number of listings available (supply) was within 0.1%. Broken down by property type we see that the sales-to-active listings ratio was 66% for apartments, 44.8% for townhomes and only 16.8% for detached houses – indicating much stronger demand for “attached” properties than for houses. Over the year, the Benchmark Price for a “typical” detached house rose a modest 4%, while townhouses were up 17.7% and apartments 22.7%. This reflects a trend across the region, where more affordable properties continue to rise rapidly, while more expensive ones are experiencing slower price appreciation. 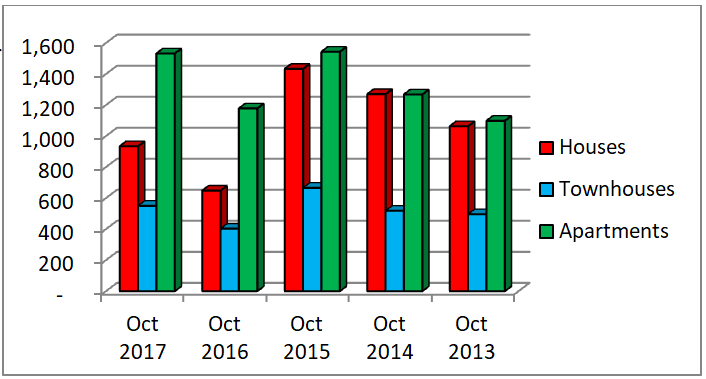 This graph shows residential property sales in Greater Vancouver over the past 4 Octobers. The number of apartment sales, and the number of townhouse sales, have been relatively consistent for the period shown, with a small dip in 2016. But the number of house sales has fallen quite a bit in the last couple of years compared to the 3 years before. Interestingly, Benchmark* house prices are still appreciating slightly in spite of the lower sales volume, up 4% in a year, while townhouses are up over 17% and apartments up well over 20%. NOTE that these stats from the Real Estate Board of Greater Vancouver do not include sales or pre-sales of new condos sold direct by developers bypassing the MLS® system. *Benchmark prices of a “typical” home.